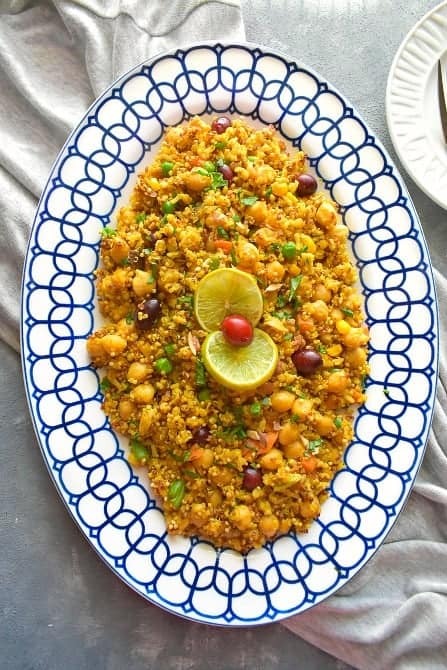 Spicy Indian Chickpea and Quinoa Pulao: absolutely delicious, easy and healthy twist to a traditional rice pulao recipe. 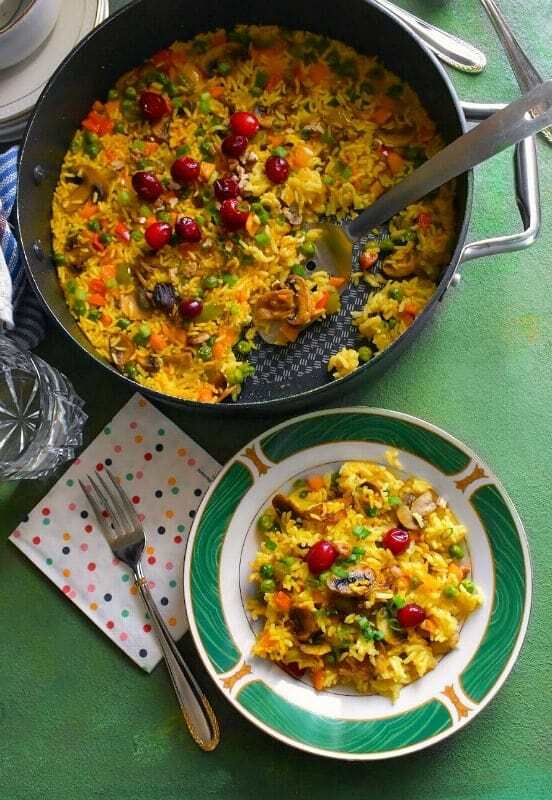 Indian Chickpea Quinoa Pulao is Vegan – Glutenfree. 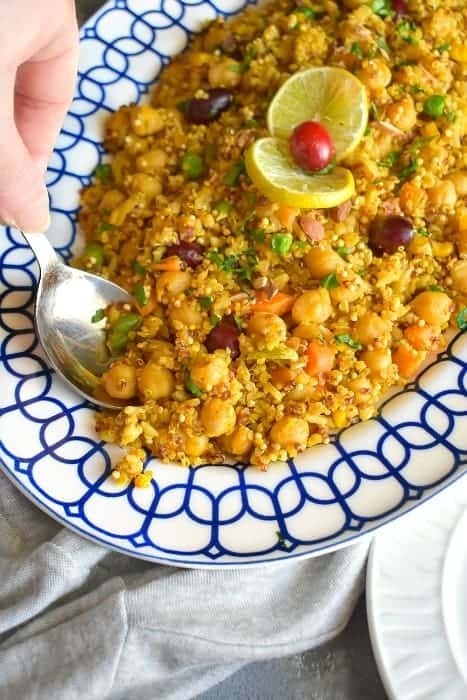 This recipe is power packed with nutrients and made using sprouted quinoa-rice blend along with chickpeas and vegetables. We made this Spicy Indian Chickpea and Quinoa Pulao for Friday night potluck dinner and it was an instant hit. Once every month, we do potluck dinner with friends and this time I wanted to take something really healthy and hearty. Because of the #football season, we are already snacking a lot since the last few days and I wanted to keep the potluck recipe light. So, all I did was, replace the regular rice in the traditional pulao/pilaf recipe with TruRoots Sprouted Rice and Quinoa Blends. 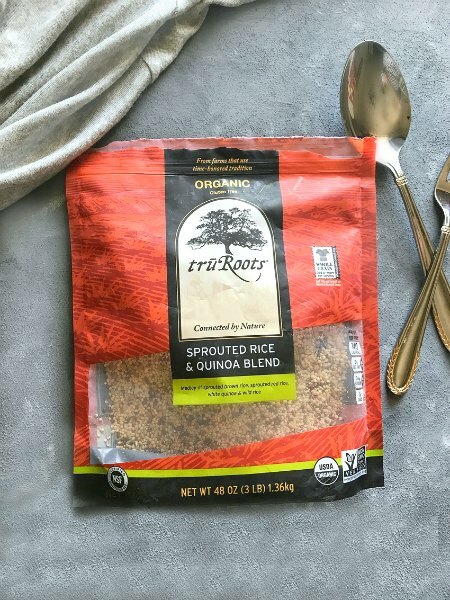 This is not the first time that I had used these blends, as I’m a fan of TruRoots products (I bought mine from Target) and keep adding their products in our everyday meal. Sprouted quinoa and much more. I love the fact that they are an organic brand with so many varieties to choose. Hence, you can replace any grain or lentil in your traditional recipes to add that healthy pin/flavors. 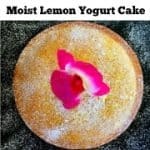 I have actually been experimenting a lot with their sprouted blends and it fits perfectly in this recipe. 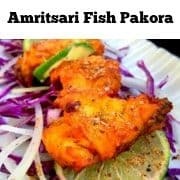 You can call it a blend of traditional and modern healthy cuisine. You get the same delicious flavors of the traditional pulao but with the added benefit of quinoa + rice blend. Also, as chickpeas are high in proteins, fiber and low in fat, this makes an extremely healthy meal and a great option for a quick lunch. Also, did you know: Chickpea and Quinoa both keep us full for longer. That means the digestive system takes longer to break the grains, digest, and process ahead. I’ve also replaced regular water with vegetable stock to make it even more flavorful, however, you can just add water and the pulao is going to taste great. 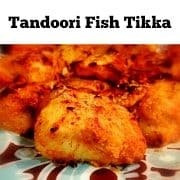 So, before you go ahead and make this recipe, take advantage of the ‘Target CartWheel Offer on Tru Roots Products‘ ! I did stock up on my favorite TruRoots products using the same offer. 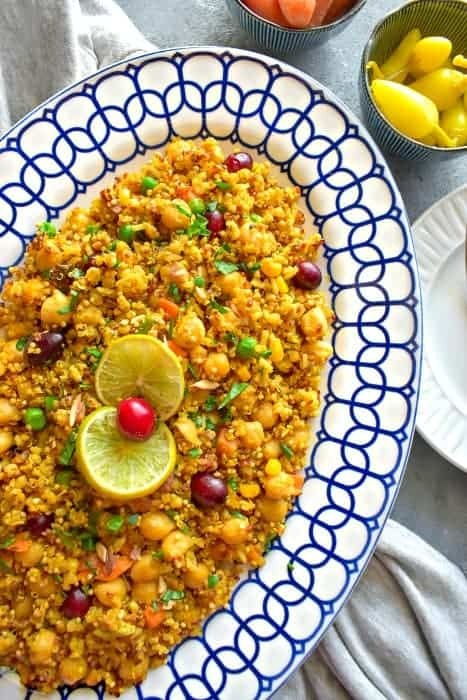 This Spicy Indian Chickpea and Quinoa Pulao also makes a great office lunch as they are absolutely easy to pack and taste as good once reheated. 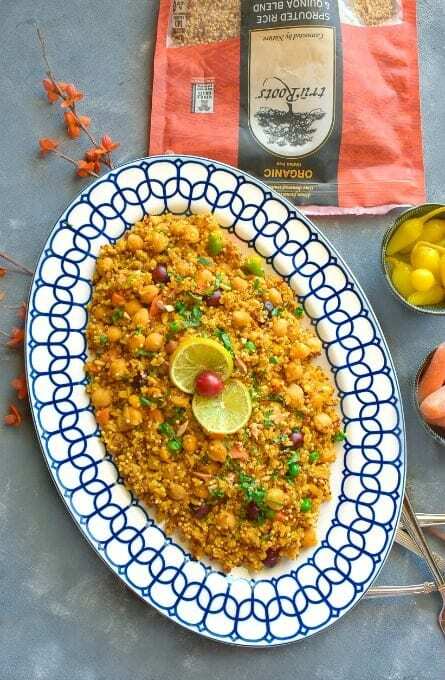 Spicy Indian Chickpea and Quinoa Pulao: absolutely delicious, easy and healthy twist to a traditional rice pulao recipe. 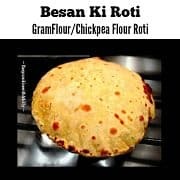 This recipe is power packed with nutrients and made using sprouted quinoa-rice blend along with chickpeas and vegetables. In a pressure cooker, add olive oil and all the whole spices. Saute this over low flame for 30 seconds. Now add frozen vegetables, chickpeas and saute for 2-3 minutes over low heat. Add powdered spices and the quinoa blend. Saute this mix for 2-3 minutes over medium heat. Now add vegetable stock or water (whatever you're using) and stir once. Close the pressure cooker lid and let it cook for 2-3 minutes (you'll get 3-4 steams). Turn off the heat and let the pressure cooker cool completely. Open the lid carefully and transfer the content to serving dish. Decorate with cranberries and chopped cilantro (I added 1/2 tsp crushed almonds too). 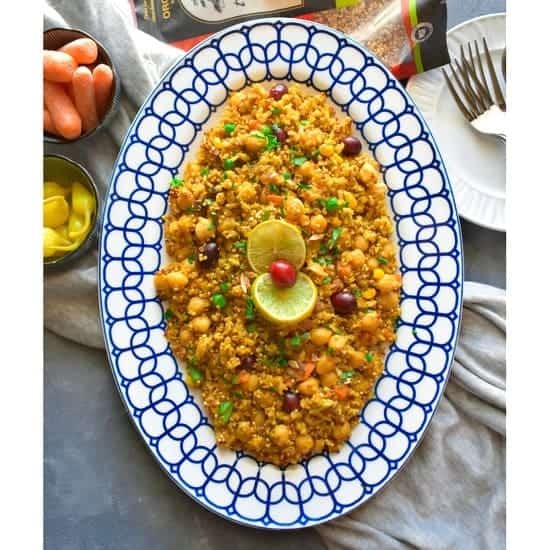 3 Replies to "Spicy Indian Chickpea and Quinoa Pulao (Vegan & Glutenfree)"
This looks like such a beautifully aromatic dish! 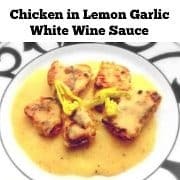 Love that spice blend!